A new dealership standard called Autohaus2 will replace the blue from the last upgrade. "We have been in this product launch mode for the last several years. I want to send a message clearly that we are not running out of gas." 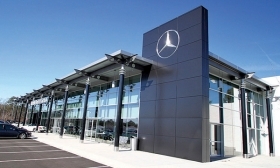 MONTVALE, N.J. -- Mercedes-Benz USA is on track to sell 400,000 vehicles in the next few years and needs 25 percent more service capacity at its dealerships, said CEO Steve Cannon. "With the segments we are adding, that growth will happen -- 400,000 cars is a couple years away," Cannon said. "There is a [dealer] network shortage. "If your network was laid out at 200,000, and every year you are sending out 350,000 to 400,000 cars, you have to take care of those customers." The service expansion could be physical -- adding bays and increasing the size of the service area. Or, dealerships could introduce a second shift to handle service business, Cannon said. Later this year, Mercedes-Benz Manhattan, the only company-owned dealership in the United States, could add a second service shift, Cannon said. "There are some stores that do that. It is not that common, but it is a great way to sweat your assets." To handle the new vehicles coming in the next few years, about 25 percent of the brand's stores need to add showroom and vehicle storage space in addition to service capacity, Cannon said. The discussions will begin with dealers later this year, with plans expected in 2016 and construction in 2017-18, Cannon said. The expansions will be in addition to a new dealership standard called Autohaus2, which mainly entails cosmetic changes replacing all of the blue that was the highlight of the last upgrade, as well as making signage changes, Cannon said. More details will be unveiled at next month's dealer meeting in Las Vegas. There, Mercedes will show dealers nine all-new or redesigned models coming in the next three years, Cannon said. It's unusual to pull back the curtain so early, but Cannon said he's doing it to remind dealers about the brand's growth plans. "We have been in this product launch mode for the last several years," he said. "I want to send a message clearly that we are not running out of gas. We are still in the beginning, and this will push through 2020." He acknowledges Mercedes is already in more segments and has more derivatives than any of its competitors, but adds, "We consider it a strength to be able to cover a market from $30,000 to $200,000 in offering performance or ultraluxury in Maybach, AMG and S class." Rather than follow the new trend of pop-up stores in shopping centers that Tesla pioneered and chief rival BMW is copying, Mercedes-Benz plans a shop-in-shop store for its AMG high-performance range. A wall will divide it from the main showroom, and specially trained salespeople will run it. The dedicated AMG space will be built by select dealers with the highest AMG sales in key markets such as southern Florida; Orange County in California; and the New York metro area, he said. Cannon said his message to dealers will be: "You need to start thinking of AMG not just as the most expensive and fastest Mercedes-Benz. You need to think of AMG almost like a Porsche franchise that sits inside your Mercedes-Benz franchise." Dealers who build the special AMG selling areas will be paid bonus money. Cannon said he won't disclose the details until the dealer meeting, where an example of an AMG shop will be displayed. Cannon said Mercedes-Benz wants several pilot shops to be built by the end of the year.